Pearl was born on August 9, 1929. She grew up in Oakland, California, and that is where she married Jack Hamilton on August 16, 1952. Oakland is also where Pearl met A. Wetherell Johnson and began working alongside her in Bible Study Fellowship. In 1980, when Miss Johnson retired and BSF moved its headquarters to San Antonio, Texas, Pearl became the Deputy Director, a post in which she served for seven years. 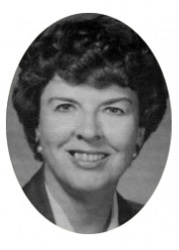 In 1987, Pearl was called to be Director of Women’s Ministries at Rolling Hills Covenant Church in Southern California. It is there she began writing Bible study lessons and founded Disciplers Bible Studies. Pearl loved God’s word and was a gifted Bible teacher. Her passion was to inspire others to study, obey, and treasure the scriptures as she did. Pearl was also a learned woman and wise in the word. She graduated from UC Berkeley and also studied at North Park Seminary, Gordon-Conwell Seminary, L’Abri Fellowship in Switzerland, and Ligonier Ministries. Pearl wrote lessons and taught weekly classes for five years before succumbing to acute leukemia on March 12, 1993. At that time, there were more that 150 Disciplers classes scattered throughout the United States and Europe. After Pearl’s death, Disciplers continued to grow and was registered as a non-profit organization with Mary Lou Damon as director. Suzie Klein took up the mantle of teaching the original Disciplers class at Rolling Hills Covenant Church and later began writing additional study lessons. Tamra Tomlin has been with Disciplers since the beginning as a faithful discussion leader and editor of lessons. She continues to serve as our prayer chairman. Elaine Johnson joined Disciplers in the early years as a discussion leader and later as an editor of lessons. She also serves as our director of operations. In 2004, Harle Damon joined Suzie in writing study lessons. Today, Disciplers Bible Studies are being used throughout the world, a testimony to Pearl’s service and commitment to the Lord Jesus Christ. The original Disciplers class at Rolling Hills Covenant Church continues under the leadership of Lynda MacDonald, pastor’s wife. The organization is in the process of going digital to make the Disciplers Bible Studies more accessible than ever before. The Disciplers website was named in honor of Barry Klein who was a faithful advocate and teacher with Disciplers for many years until his death. Barry was often heard saying, "We need to get Disciplers Bible Studies online -- thus, Disciplersonline.org. Many lives have been touched and changed by God through Pearl’s life and through her legacy of Disciplers Bible Studies. May God continue to use Disciplers Bible Studies to His glory. Before Pearl Hamilton went to be with the Lord in 1993, she designated Mary Lou Damon as Head Administrator of Disciplers Bible Studies. Mary Lou served faithfully in that position for twenty-one years. In Mary Lou’s words, “It was one of the most wonderful blessings in my life to see the growth God gave to Disciplers, and to me. He richly blessed us with support, encouragement, and resources to meet both opportunities and challenges that He had planned and blessed for the Disciplers ministry. After living a full, productive, and godly life, Harle went to be with the Lord in 2009. His beloved wife, Mary Lou wrote this remembrance of him. “Harle was a wise man who built his life on the rock of God’s word, the Bible. For him, that meant hearing and obeying Christ’s words and living according to Scripture. Harle was born again to a relationship with Jesus Christ in his mid-forties. He studied under many wonderful pastors and the more he learned of the Bible, the more he wanted to learn. When he retired from business, he enrolled at Talbot Seminary and spent six years in study, graduating with a Masters Degree in Theological Studies. He then organized and directed a college level program in leadership training at Rolling Hills Covenant Church. After thirteen years of directing the school, he retired.